Michigan Avenue holds a lot of history in Chicago. Some of the most memorable and historic buildings populate the busy street–from Symphony Center to the Cultural Center and the Art Institute. Rarely do we go back even before the time that these buildings were built though, to the land as it was originally, and the indigenous people who called it home. That changed last Thursday, however, as the Chicago International Puppet Theater Festival, which spans 11 days, with performances representing 11 different countries at 19 different venues, presented its opening show, Ajijaak on Turtle Island by Heather Henson’s company, Ibex Puppetry. Instead of launching straight into their tale, the Chicago International Puppet Theater Festival director took time out to honor the land the Studebaker Theater stands on, and the tribes that lived on it. This would set the tone for an evening meant to honor not only the indigenous people who populated Illinois and the country at large, but also the land on which all of us have built our homes. This was followed up by a short talk and powerful performance by Wayne Silas Jr., who talked about his time in Chicago’s own indigenous community at the American Indian Center of Chicago, formerly on Wilson Avenue, and the difficulty of “walking between two worlds,” something that would later be echoed in the play itself. Ajijaak on Turtle Island is the tale of a crane, or ajijaak in Ojibwe, and is based on Ojibwe, Lakota and Cherokee lore. The story, written by Ty Defoe and based on Heather Henson’s hand-drawn storyboards, is cleverly set up, with a charismatic main narrator, Joan Henry, who brought great warmth, humor and love to the role. She acts as an intermediary between the audience and the story, and on stage, is relaying the tale of Ajijaak on Turtle Island to her grandkids–the talented puppeteers and dancers. Ajijaak is the tale of a special crane, given a medicine bundle and told that she is to keep the world in balance, so as not to wake a monster that sleeps under the waters, and is awakened by irresponsible people who only take from the land. Ajijaak, played by Henu Josephine Tarrant, travels around the nation after getting separated from her parents in a fire. On her first migration cycle, she begins learning from other animals and meeting other people, while also seeing the destruction brought on the forest and the buildup of cities, which threatens to wake up the sleeping beast. She learns to use her voice and learn from others, and in the end, uses those lessons to help restore balance. Ajijaak on Turtle Island is immediately stunning. Heather Henson brings the Henson legacy to life, with beautiful puppets that are either delicate and simple or elaborate, intricate works of art that, simply put, couldn’t have come out of any other place than the Henson Creature Shop. Projected background visuals, handled expertly by Katherine Freer, and scenery by Christopher and Justin Swader, are pitch-perfect, evocative and subtly stylized to match the beautiful puppets and kites that take center stage. The Henson magic is also in the handling of the puppets, and all members of the cast, especially Tarrant as Ajijaak, have a studied hand that make them simply seem like they’re hanging out with the puppets they control, while so accurately portraying the various animals in the story, and, amazingly enough, dancing and singing. It’s the kind of expert hand and spirit that embodied Jim Henson’s work, and Heather Henson more than continues this legacy, enough that you can’t help but recall his work watching hers. Even as the story covers larger topics like protecting and respecting the land, plants and animals around us, the core of the story still centers on love and family, a Henson hallmark. Music, too, is incredible in Ajijaak. Performers are all strong vocalists, though here too, Tarrant stands out in a league of her own, but the full cast can certainly create an amazing choir with beautiful harmonies, thanks to music by Dawn Avery, Larry Mitchell, Kevin Tarrant and Grammy winner Ty Defoe. Quite often during the performance strong drums and native music would fill the theater, often simultaneously with fantastic traditional dancing. One of our favorite moments in the play, musically and comedically, was Tony Enos, who brought the spirit of a turtle to life with a hip-hop flair and an incredible energy. There’s no place you can point to where something spectacular isn’t happening. Ajijaak is magic on stage, from ethereal cranes and the artistry even in stage hands changing scene by “deforesting” during a swelling musical number to kites reaching the heights of the theater, and a final set piece that literally fills the stage. The show is family friendly but, as we’ve come to expect from the Henson family, not in a way that will have parents thumbing through Facebook. Ajijaak on Turtle Island presents simple but powerful messages–about caring for the planet, finding independence while remaining rooted in your history and family, learning from those who aren’t like you, adapting to new environments and finding your way–in an incredibly artistic and memorable way. Chicago kicked off the tour for this show, which will travel from Chicago to Baraboo, Wisconsin, and the AI Ringling Theatre this weekend before traveling on to Rhode Island and later, New York. 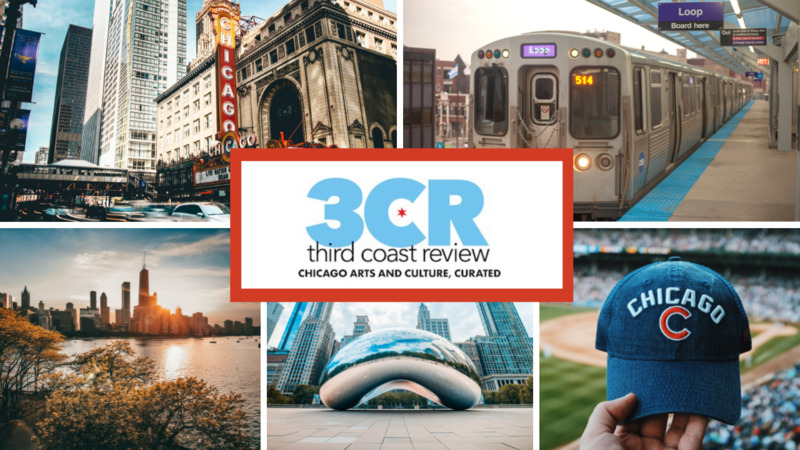 Meanwhile, if you’re here in Chicago, you should check out the stunning lineup from the international artists who make up the festival, and see what else soars. For more information on the Chicago International Puppet Theater Festival, which runs through January 27, click here.